In a New Zealand first, a multi-channel hydrophone streamer has been used in conjunction with a boomer source to seismically image post-glacial sediments in the floor of Lake Ohau, Mackenzie Basin, adjacent to the Southern Alps, New Zealand. By integrating this dataset with existing geophysical data in a three-dimensional framework, a seismic stratigraphy has been defined, which, when combined with geological data will help develop a better understanding of climate variability in New Zealand since the retreat of glacier from the Ohau valley at the end of the last ice age. Lake Ohau exhibits sedimentary units typical of deglaciation and subsequent post-glacial deposition. The seismic stratigraphic units correspond to changing depositional environments; ice-contact and sub-glacial outwash and till; pro-glacial glacio-lacustrine meltwater deposits; post-glacial lacustrine deposits, are defined from the six seismic facies identified. Further- more, Lake Ohau exhibits multiple deformation structures, in particular, a landslide caused by catastrophic slope failure soon after the Ohau glacier had receded. Further structures present are multiple gravity flows, originating from the Ben Ohau range and slump deposits present along the eastern margin. Natural gas is a common and widespread feature within the Ohau stratigraphy and indicates the change from a pro-glacial to a post-glacial depositional regime. The results reveal that Lake Ohau has recorded the process of de-glaciation since the Last Glacial Maximum, with no active faulting, thus providing an excellent, undisturbed sedimentary record of the last ?18,000 years, when combined with well-hole control. This study allowed comparison of the different seismic surveys, demonstrating that CHIRP and multi-channel seismic data, respectively, provide quality images of high resolution and good depth penetration. 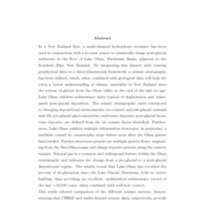 Krause, Michael Anthony (Mike), “Characterising change in post-glacial climate using seismic imaging of Lake Ohau sediments,” Otago Geology Theses, accessed April 22, 2019, http://theses.otagogeology.org.nz/items/show/632.